The important thing to get from segment #4 is to give your Internet visitor exactly what they are searching for. If they are searching for dental implants in Goliad, TX, then deliver them specific information, starting on page 1 about Implant Dentistry and then give them clear links to more detailed implant information. 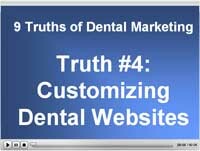 For access to all the videos in the 9 Truths series, click here: 9 Truths of Dental Marketing.